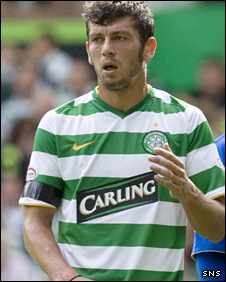 Celtic's Italian midfielder Massimo Donati has returned home after agreeing a four-year deal with Bari. The 28-year-old, who moved to Glasgow for £3m in 2007, has been a regular under new Celtic manager Tony Mowbray. Mowbray told BBC Scotland that the move had been completed, but suggested that any income made would not necessarily be used to bolster his squad. "The club are looking to get a few quid back in, so the money is not openly there to go and spend," said Mowbray. Donati admitted in April that he would welcome a return to Atalanta, where he began his career and was on loan before joining Celtic from AC Milan in 2007. But after falling out of favour under Gordon Strachan, he has been a regular starter this season under Mowbray.